After working in the heat and humidity today, we decided it was high time to remove the storm windows in our screened-in porch. It’s really our “family room” during the summer. Our dining room table is temporarily retired and we open the french doors. It is here that we have our morning coffee, our evening cocktail, eat our meals and play endless games of domino’s. Overlooking the lake, surrounded by trees and our flower gardens, it is our sanctuary at the end of a hectic farm day. After a shower and Bloody Mary, I wanted to make something in contrast to the heavy humidity of the past several days. 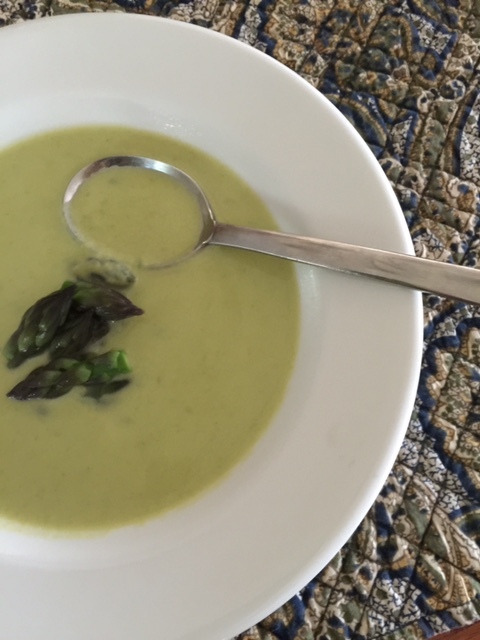 Remembering I had purchased beautiful English cucumbers from Real Food at the farmer’s market on Saturday; it was time to turn them into a refreshing chilled soup. 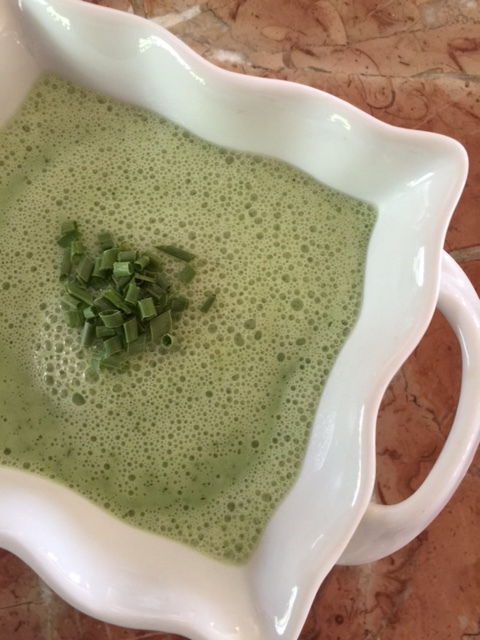 This is super easy and just right for those night’s when your tired but want something quick and healthy. The olive oil gives this soup a creamy texture. Place all ingredients except the olive oil in a blender. Puree until smooth. With the blender still running, gradually add the olive oil until incorporated. Transfer to a bowl and chill for at least an hour. Ladle into bowls and garnish with additional dill or cilantro. It’s March 1st and winter still has us in her clutches, with no sign of letting go anytime soon. I tell myself “no problem” and head into our basement to see what vegetables are still holding up. I find both white and orange sweet potatoes and carrots still in good condition. I dig around the freezer and find a quart of homemade chicken stock. I grab some onions and garlic and head back upstairs. 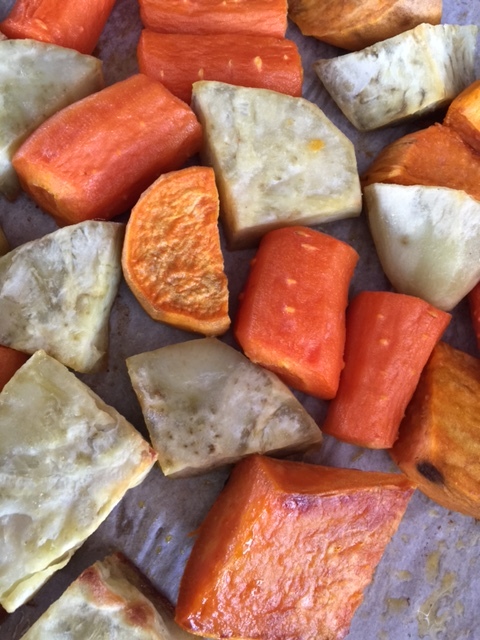 Whenever I want to make soup using root vegetables, I find I like to roast them first. It always gives the soup much more depth, not to mention those warming smells in the kitchen. As I’ve mentioned both in my previous blog Basics With A Twist, and this one, I always lean toward the savory, I enjoy herbs and spices and love what they do to food. It’s really ethnic cooking at its finest. 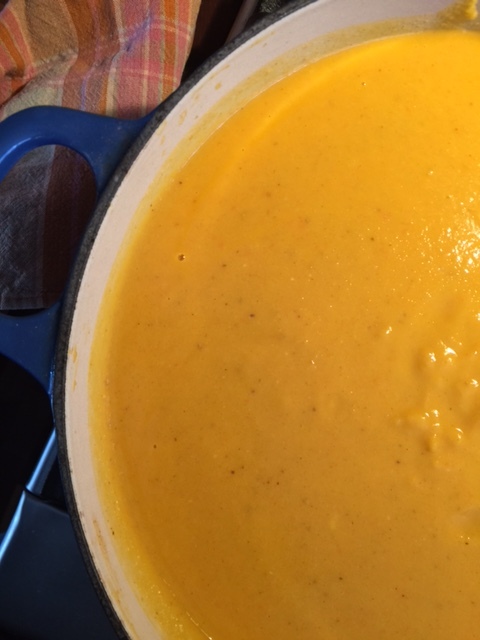 With this soup I’ll roast the sweet potatoes and carrots to make a puree for the base. 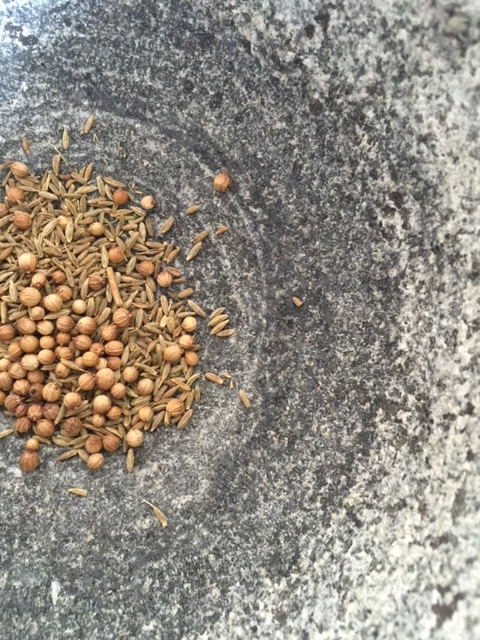 While they’re in the oven I will toast cumin and coriander seeds. Toasting whole seeds releases a flavor far superior to purchased ground spices; you’ll find the scents exotic and sensual. Although you can grind them in a spice mill, I prefer to use a granite mortar and pestle. 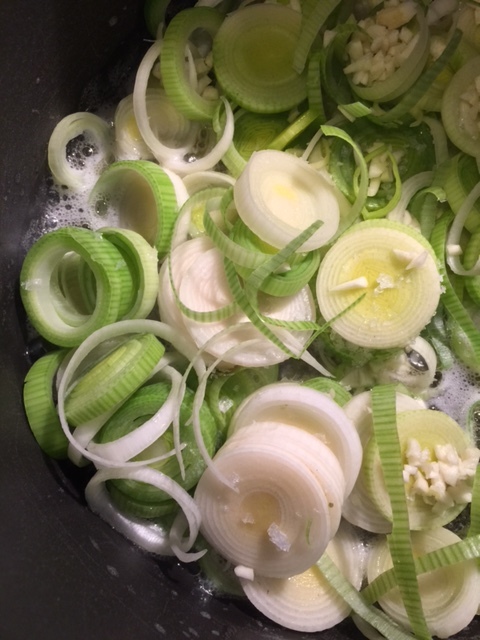 I also use shallots, rather than onion, and brown them slightly. I like how the sweetness of the root vegetables pairs with the intensity of the spices. Puree it altogether with a bit of apple cider vinegar and it really comes alive. I enjoy topping it with toasted pepitas (pumpkin seeds) and chopped cilantro. Preheat oven to 400 degrees. Peel and cut sweet potatoes and carrots; place in a large bowl. Drizzle with olive oil and sprinkle salt. Toss until well coated; place on large sheet pan lined with parchment paper. 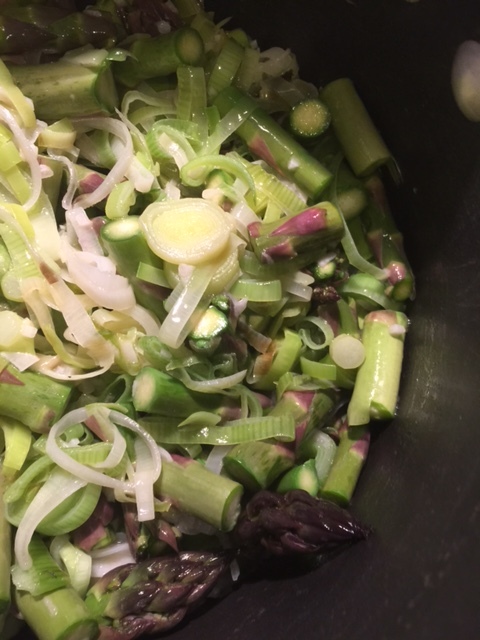 Place in oven for 40 minutes or until soft; turning vegetables halfway through. Cool. While vegetables are roasting, place cumin and coriander seeds in small dry skillet over medium heat and toast until lightly brown. Grind in mortar and pestle or in spice grinder. Set aside. After vegetables are cool, place half of them in a blender with some of the chicken stock and puree until smooth; pour into large bowl and set aside; repeat with remaining vegetables and stock. Melt ghee and olive oil in large pot. Add sliced shallots and pressed garlic. Saute on medium until soft. Add ground cumin, coriander, salt and ginger. Stir for 1 minute. Add cinnamon and cayenne. Pour half of vegetable puree into pot with shallots and blend with stick blender until smooth. Add remaining puree and coconut milk. Heat on low until warmed through. Add apple cider vinegar and mix well. Ladle into bowls, topping with a few pepitas and chopped cilantro.